Systems of any kind seem to be increasingly judged as either good or useless, e.g. Modern (good) Traditional (useless). Kenpo (or any martial arts method) can be sometimes viewed by its practitioners as the perfect method or system, with everything in its place and a place for everything, but occasionally when a practitioner is unable to give a good account of him or herself outside the comfort zone of the training hall say in a "open "competition or street situation then it is the whole system that is at fault and not the practitioner, who for a variety of reasons was unable to formulate the correct physical answer when questioned physically! Unfortunately disappointment in life is something that we have to learn to cope with; the blame culture is too easy a route to follow when things sometimes don't go as planned, "I lost the match/fight but it was the systems or trainers fault or both"! Sometimes the problem can be because a practitioner stays in the narrow practice method of "by the book" or "sequence completion" and does not venture into the exciting area of ideas!The challenge of moving into the unchartered areas of experimentation is that you have to deal with being wrong or mistakenly following the wrong path from time to time. I have found that this is actually healthy when attempting to develop a robust method of practicing Kenpo; it keeps you grounded and focused. When I began to chart my course in to the Kenpo world of ideas I needed a solid basic idea from which to build upon or one to which I could return to when I needed to assess where I was, where I have been and "even" maybe where I was going. This simple but logically based process came in the shape of two powerful words Identify and Justify. Because I advocate the expansion and exploration as a method of developing Kenpo, I needed to be able to answer the standardised questions "who showed you that"? Or "where did you get that idea from"? If you can Justify what you are doing by demonstrating how you arrived at that stage of development by interpreting the systems information then you are ready to Identify how you did it to anyone. This is a strong position to be in, not only being able to demonstrate a System but also being able to share with anyone what you are doing, why you are doing it and how they can do it within The Kenpo System. 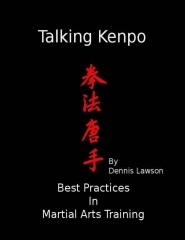 Occasionally you may hear a statements from practitioners who practice what they have been shown without exposure to Kenpo's methods of self analysis or self correction, which are "that isn't Kenpo" or "that's not the way the founder showed me", these kinds of understandable defensive statements can also be addressed with the identification and justification process. Some Martial Artists are happy to stay in this restricted "tick the box and move on" method of "progress", which is ok by me as this is initially how most begin training, but in my experience it eventually becomes is a stifling way of training, an unfulfilling way to teach also it seems to build in false limitations to training and practice. So I am advocating that practitioners research what they are shown and tailor the information which maybe physical or theoretical to their needs at that time, it may be passed on to them personally, via video format or interpreted from some written source, but by researching it you can make it yours and work for you. This method of training should actually compound your system rather than dilute it. Read all the information that you can about a subject and then relate physically to it by training and practice, which I see as two linked but separate processes. Kenpo when fully embraced is a "useful "system for learning, it gives the freedom to un-restrictively explore subject matter without limitation but within a realistic structure that keeps the practitioner grounded in logic., Oh yes it's also good fun.